Located on the west bank of the Cooper River is Charleston’s former Naval Station. Closed down in the mid 1990s, the three miles of river front was seen as a large investment in real estate. In charge of redeveloping this $60 million dollar area including 21 piers and around 600 miscellaneous buildings was the Charleston Naval Complex Redevelopment Authority. It has since been renovated to meet the commercial and residential needs of the largely populated city. 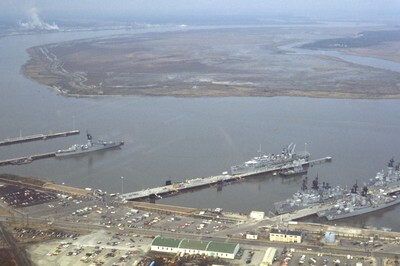 Smolski, Chet, "Charleston: Naval Base" (1978). Smolski Images. 800.